STOP! Don't reach for that fattening calorie laden chocolate bar. Look at the great healthy snacking options Herbalife has to offer everyone! We've got a triple treat of premium quality snack bars with our luxurious rich and flavourful Vanilla Almond recipe. 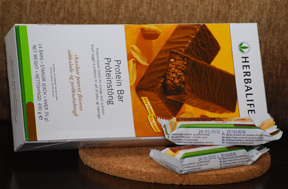 These bars are made with real chocolate, but contain less fat and calories.